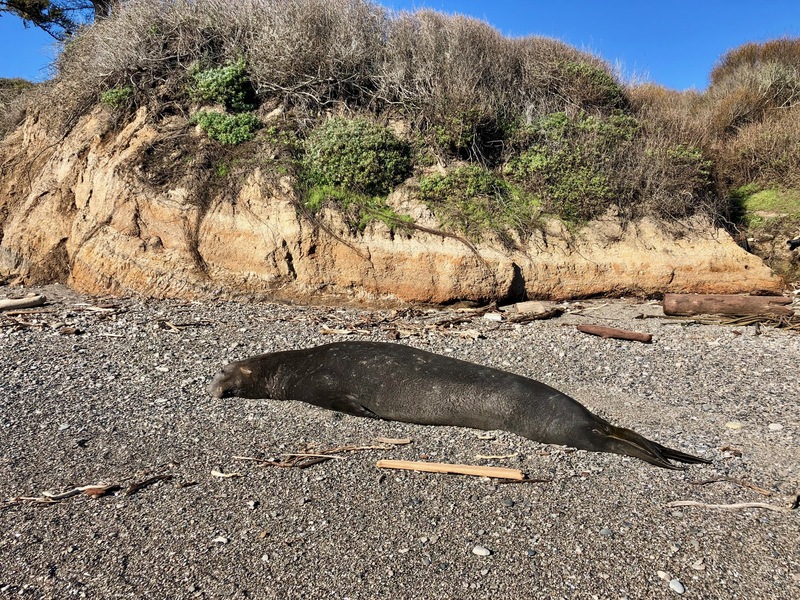 Most visitors to Año Nuevo State Park this time of year are looking for elephant seals. Our family went in search of a snake. The San Francisco Garter Snake, to be exact, an endangered species that makes its home in that area. C20 has been desperate to find one. 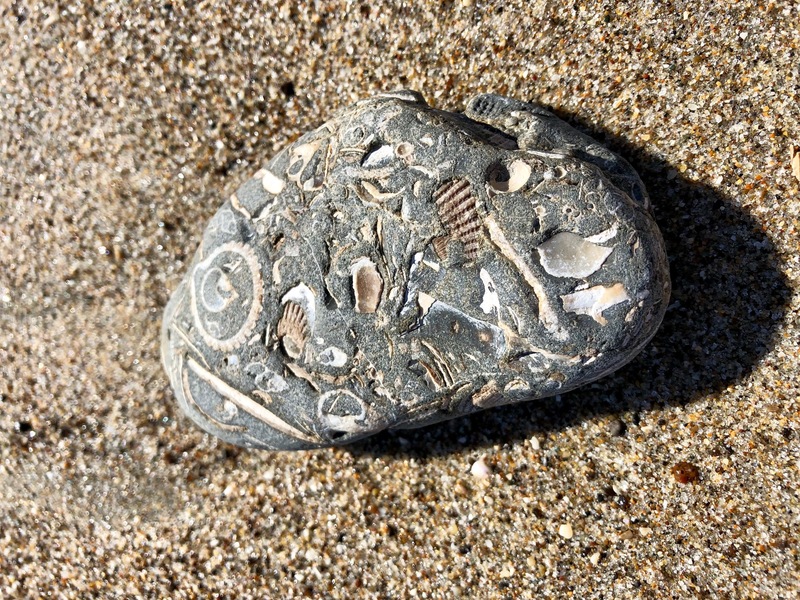 We decided to make this President’s Day holiday a family day which, for us, almost always involves a trip to the beach. 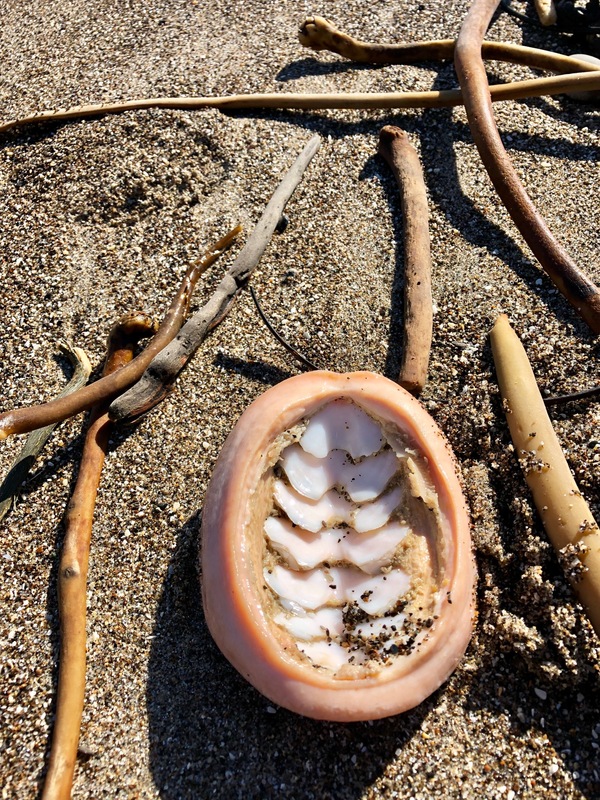 Facebook memories showed me a picture from our last trip to Año Nuevo, years ago, and that influenced our destination. We couldn’t have ordered a more beautiful day. First stop: Santa Cruz, where we picked up lunch at Pizza My Heart to eat on the West Cliff Drive seaside bluffs. 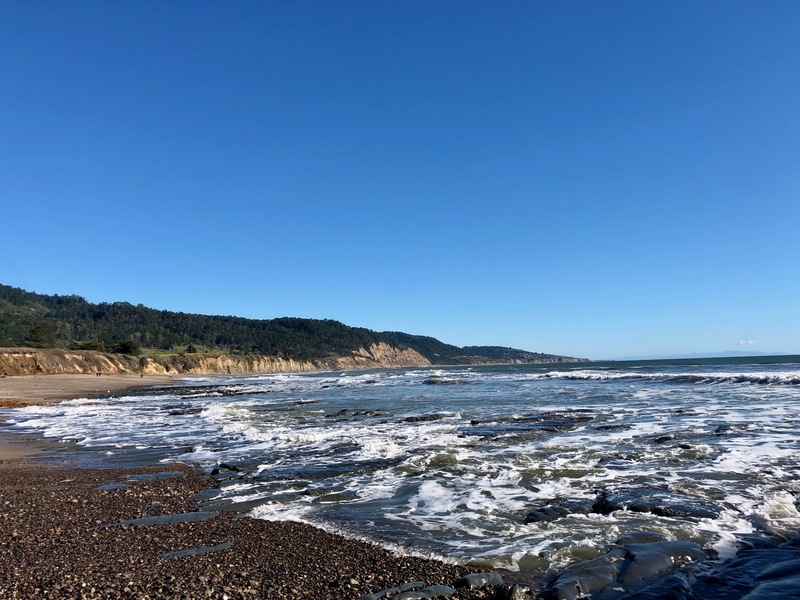 From there, we drove to Natural Bridges State Beach, hoping to see wintering Monarch Butterflies; we only saw a few flitting on the breeze and not the thousands that sometimes shelter in the eucalyptus groves. 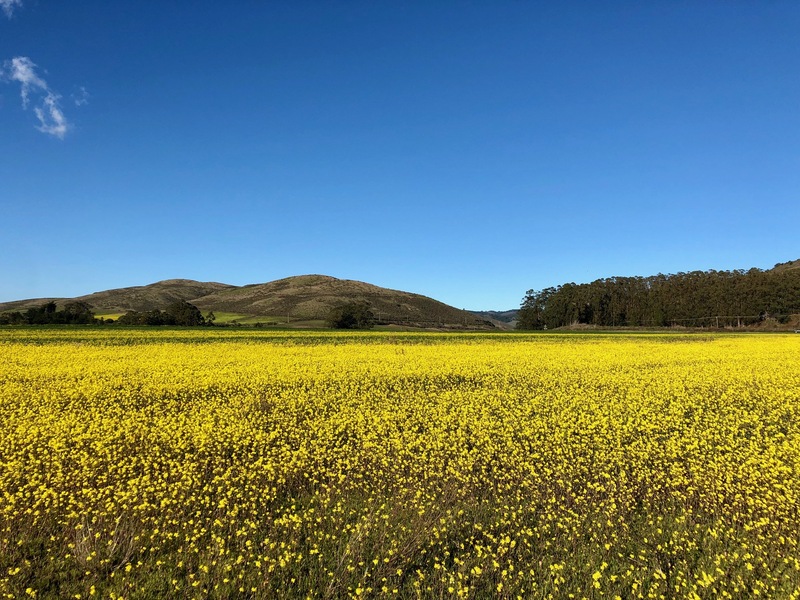 Back in the car, we took Highway 1 to Año Nuevo, with ocean views to one side and fields of fluorescent yellow mustard and sour grass flowers on the other. On our way home, we stopped to take a picture in one of those fields and sank ankle-deep in mud. Wet and smelly, but I couldn’t stop laughing. As we paid our park entrance fee, the ranger asked if we had a reservation for a guided seal walk, the only way you can access the seal breeding ground area. We said no, we were looking for a snake. She cocked her head in amusement and explained that snakes don’t often come out on chilly days, but that they’d be near the pond if anywhere. I stopped to look at a vine with a distinctly violet hue–I’ve never seen a naturally purplish thorn bush before. As I leaned forward for a better look, I saw a tail slither away. I shrieked in surprise, which brought Guy and C running. The shriek shook my Cool Mom I’m-so-good-with-snakes vibe, but I honestly did not expect to find the snake. I didn’t even expect that C would find one, though if anyone could find an endangered and elusive wild snake in the thorn bushes along a pond, it would be him. The rest of us went to the beach while he just about crawled along the path. We saw a number of sleeping elephant seals, and someone did tricky aerial maneuvers in a biplane–disruptive to the beach-calm, but cool nonetheless. When we had walked the length of the beach in both directions, photographed the log-like seals and some beautiful pebbles, and breathed in deep the salt air, Q14 came down the stairs to wave us back up. 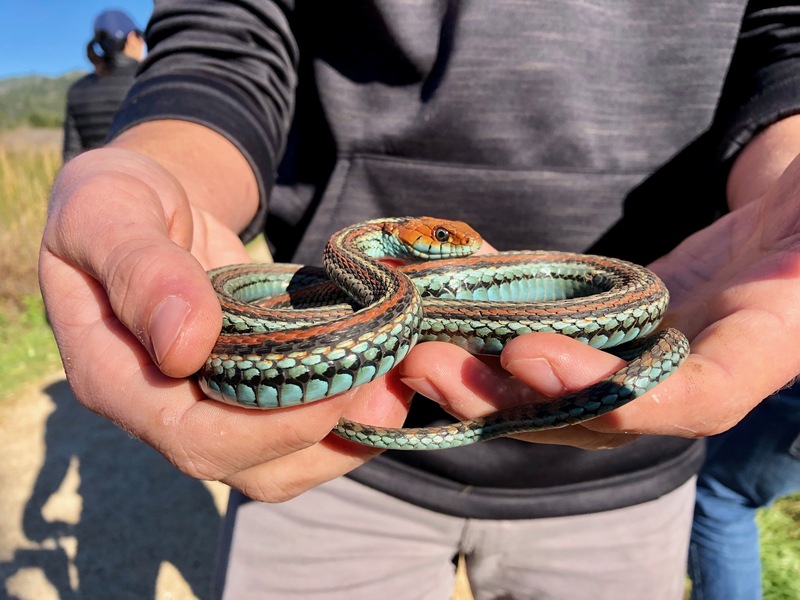 Because he’d done it: C20 had found–and caught–a San Francisco Garter Snake. Two surprises: 1) the snake is far more stunning than I could have believed, and 2) the snake appeared super chill that this strange dude was holding him and showing him off to passersby. C said the snake knew he wasn’t a threat, and it sure looked like the truth. The snake may have been calm, but my kid buzzed with happiness. To all the detractors who think I’m nuts because I encourage his passion for creepy-crawlies, we do a lot of things that might seem crazy for the sake of love. And today we got a crazy-fun family day out of it. P.S. No snakes were harmed in the making of this story, and we left snakey-poo right where he’d been before. Spoiler alert for the squeamish: all snakes are back in secure cages. Yes, you read that right. All snakes, because we (intentionally) have several. Five, to be exact. C20 thought he wanted to be a herpetologist (reptile expert), but turns out, that college major involves way more math than he wants to do. Meanwhile, it’s his passion and his gift. So, five snakes, as well as two leopard geckos, a tortoise and a rabbit, three cats and two dogs…quite the menagerie. The first snake, a red tail boa, was the most difficult for me to agree to. He promised it would stay “snake sized,” as he held his little hands to the width of his slender shoulders. I decided I loved my son more than I feared snakes, but that darn thing now measures over six feet, longer than he is. Having said yes to one–and seeing how he cared for it and followed my careful guidelines–saying yes again was less of an issue. In fact, I suggested Snake #4 as incentive to get his college application essay written. Obviously, he wrote about reptiles. The week after C20 brought home #5, he and his dad refurbished an old media cabinet, adding a mesh top and glass doors, transforming it into a condo for the Big Snake. Without reminder, he added a sturdy lock, my Top Priority. Impressed with their creativity and elbow grease, I posted a picture online of the finished result and, predictably, friends commented on how small the lock was in comparison with the snake. I didn’t realize that the new snake did not have a lock on her cage. He figured she was so small she couldn’t get out. When the neighbor brought her children over to see the snake in condo, Guy thought he’d show them Baby Snake in comparison. He opened the lid, reached in, and found…nothing. The first time a snake got loose in our house, C had been holding her on his lap while he played a new video game. She slithered away without him noticing. When I discovered kid and dad taking apart our couch in search of snake, I promptly took myself shopping and returned when they’d found her, hours later, across the living room inside the warm printer. I didn’t panic this time. In fact, I almost wished Snake #1 had gotten out instead of #5; stuff of nightmares, but he’d be easier to find. C did a thorough cleaning of his room, then got his brother to do the same. Online research suggested putting plastic grocery bags on the floor so you can hear the snake, or flour so you can see a trail (I nixed that one). Everyone said to leave the lid off her cage; he moved her cage from its spot on a closet shelf to the floor. Finally, he put a heating pad on the floor with her hide on it, thinking she’d come back for warmth and security. He also moved her cage back to its shelf since that idea hadn’t worked, though he left the top off. He went to bed Sunday night feeling hopeful. First thing Monday, he checked the heating pad. No snake. He heard something, and was shocked to discover she had returned to her cage (hallelujah!). But we all can attest that the shelf had been empty… Snakes aren’t like geckos, able to stick to and climb straight up. How she managed to return to her cage is a mystery. We’re flabbergasted. C names his snakes for ancient mythological characters. I suggested he change her name from Aurora to Loki or Anansi, the tricksters. But then I realized: she reappeared at dawn, and Aurora means dawn. So, aptly named after all. And now there’s a great big, heavy book weighing down the top of her cage. No more unintentional adventures for this snake. Some may call it bribery. I call it motivation. Initially, the goal (mine, at least) was to get Teen’s college application essays written before the school year started. Despite the 2-session college essay workshop he attended, that didn’t happen. The college counselor came to our home to talk through the process, yet Teen has felt so overwhelmed by this extra layer of life-reorienting paperwork and studying on top of his regular regimen of school, studying, sports and activities, that he couldn’t find the motivation to start, stuck behind the starting line. Me (washing dishes): Teen, how about those college apps? Teen (watching TV): Nah, it’s the 10-year anniversary of the Croc Hunter’s death. I’m gonna watch reruns on Animal Planet. Me: Hit “record” on the DVR and watch them later? Me (an hour later): Teen? College apps? Teen (watching TV): Mom! I don’t think you understand–when you nag me, it makes me less likely to do anything else! Me (walking into the next room and leaning down close so I can speak quietly): And I don’t think you understand that when you don’t do what you need to do I get frustrated and feel less like helping you. Sunday Teen had a proposition. Teen: Mom, I have an empty tank to fill. Can we go to the reptile store, please? Me: Why would I buy you a reptile when you’re going to college in a year? Teen: I’ve been saving money. And I can take it with me to college (despite our repeated words to the contrary he really believes this and won’t be talked out of it). Me: Tell you what–you get steps A, B & C done, plus your chores, and tomorrow we can have a conversation about another reptile under our roof. While Guy and I went out that evening, Teen spent hours working on college apps. He’d gotten way more done than I’d expected, so we took a trip to the reptile store. Teen was unusually relaxed and talkative on the way there. He shared his favorite things about this school year so far, what he’s learning and enjoying. He confirmed the serious Mom Points I was winning by willingly engaging his interests. Though I usually stick to the frog section of the store (dart frogs are way more my style), I was all his, asking questions about what he liked/didn’t and allowing him to share his generous knowledge. Hence I saw it one flash of a second after he did: a striking ball python with unique coloration. 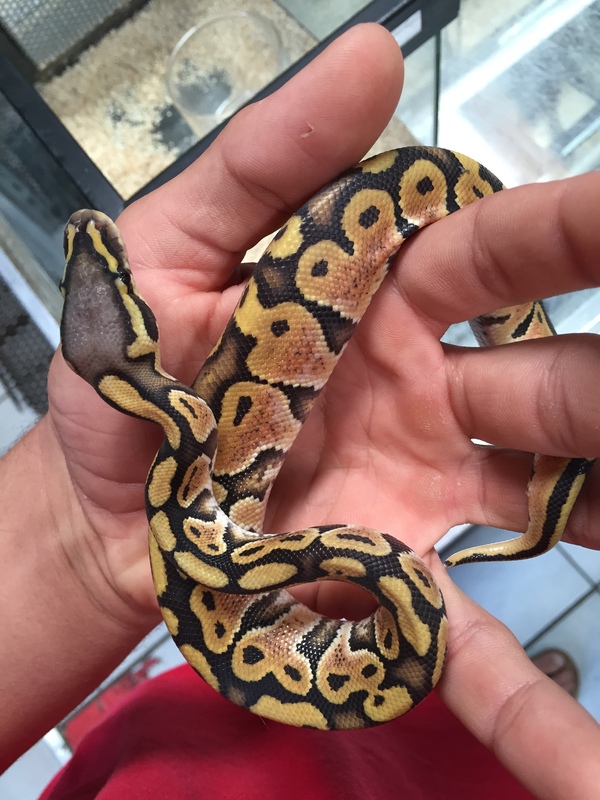 Teen already has two ball pythons. They are curious, active, beautiful (if you can talk yourself into being willing to admit a snake can be beautiful), bred for genetic diversity and coloration. I recognized my bargaining chip. He held it, just a baby, and began to fall in love. He held several others, some double the price, and came back to him. I joked he could name the snake “Motivation,” “Mo” for short. Teen wrote about his passion for reptiles. Could their be a more fitting reward for this kid? Teen named his new pet Orpheus (all his pets have mythological names). Orpheus’ wife, Eurydice, died of a snake bite. He descended to Hades to rescue her, and his gift with the lyre melted Hades’ heart. Hades granted him his wife back under one condition: she would follow Orpheus as he walked to the light. If he turned around to look at her before they had both emerged, he would lose her forever. A few feet short of his goal, Orpheus lost faith and turned, catching glimpse of Eurydice’s shadow as she was whisked away from him. The carrot (snake) dangling before his sight sent Teen hurtling past the starting line and, now that he’s moving, more movement will come easier. If his motivation lags, I will point him to the tale of Orpheus: you can’t turn back before you fully reach your goal. Don’t lose faith.